No. 1	Soft - is an extremely pliable modeling clay primarily used to make large (monumental) sculptures. Its soft consistency allows it to be easily scraped from molds. And this clay becomes more pliable with age. No. 2	Medium - is the specific consistency favored by most sculptors, professional and amateur alike. Providing a perfect balance of softness and firmness, this oil- and wax-based modeling material is commonly used in the creation of heads, busts and figure pieces. No. 3	Medium Firm - is the preferred choice among those sculptors modeling smaller pieces such as bas-reliefs, doll heads and miniature figures. In addition its firmness allows the artist to sculpt in greater detail as well as using it for design mock-ups. 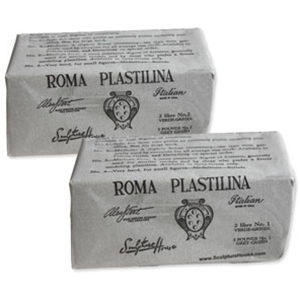 At its introduction, in the early 20th century, and based upon Italian formulations, ROMA Plastilina was and continues to be a wax- and oil-based modeling clay made with sulfur. The sulfur gives the Plastilina that extra smoothness and flowing ability that professional sculptors did and still do require in their clay. Both its proprietary formula and manufacturing process for ROMA stand today. Due to the wide variety of new and advanced mold making compounds, such as Silicone and Platinum Silicone, please note that some of these mold making compounds may contain chemicals that may not be compatible with sulfur. To avoid any complications with the mold making and casting process we suggest that you apply, either by brushing or spraying, a thin coat of separator to the clay model first. For example, you can use a crystal clear aerosol spray or shellac cut 50/50 with denatured alcohol. With this step, you should be able to avoid the adverse reactions to some of the chemicals in the mold making ingredients. If you have any questions about the materials chosen for your mold making and casting process, we strongly suggest that you contact the manufacturer of that material and ask about its compatibility with a Plastilina containing sulfur. And always, test your mold making and casting materials on some of the ROMA before tackling the complete project. Click here for Recommended Quantity Guidelines. ROMA Plastilina, Grey-Green, No. 1, Soft, 2 lbs. ROMA Plastilina No. 1 - Soft - Grey-Green - 2 lbs. ROMA Plastilina No. 2 - Medium - Grey-Green - 2 lbs. ROMA Plastilina, Grey-Green, No. 3, Medium-Firm, 2 lbs. ROMA Plastilina, White, No. 2, Medium, 2 lbs. ROMA Plastilina No. 2 - Medium - White - 2 lbs.